of............................. (hereinafter called the employee) the Part time Instructor of the OTHER PART. 1- That Zila Basic Shiksha Adhikari shall psy the ensployee at a fixed honorarium ?Seven thousand only ((‘7000/-) per month. 2- That the Zila Basic Shiksha Adhikari is providing employment to the employee only for a period of 11 month from the date ofjoining. After expiry of period the contract may or may not be renewed, as per the G.O.No. 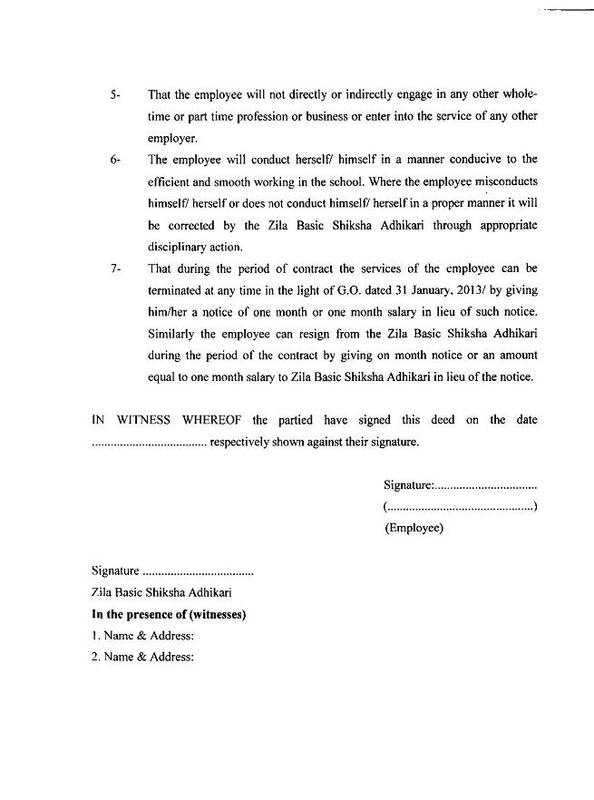 3371/79—5—2013—5/2010 dated 31 January 2013 and the employee shall have no claim either for regular appointment or for renewal of contract. 4- That an employee during the whole tenure of service will devote time and attention to the work in the allotted school. 5- That the employee isill not directly or indirectly engage in any other whole- time or part time profession or business or enter into the service of any other employer. 6- The employee will conduct hersclfl himself in a manner conducive to the efficient and smooth working in the school. Where the employee misconducts himself! herself or does not conduct himself! herself in a proper manner it will he corrected by the Zila Basic Shiksha Adhikari through appropriate disciplinary action. 7- That during the period of contract the services of the cmployee can be lentinated at any time in the light of GO dated 31 January. 2013/ by giving hini,her a notice of one month or one month salary in lieu of such notice. 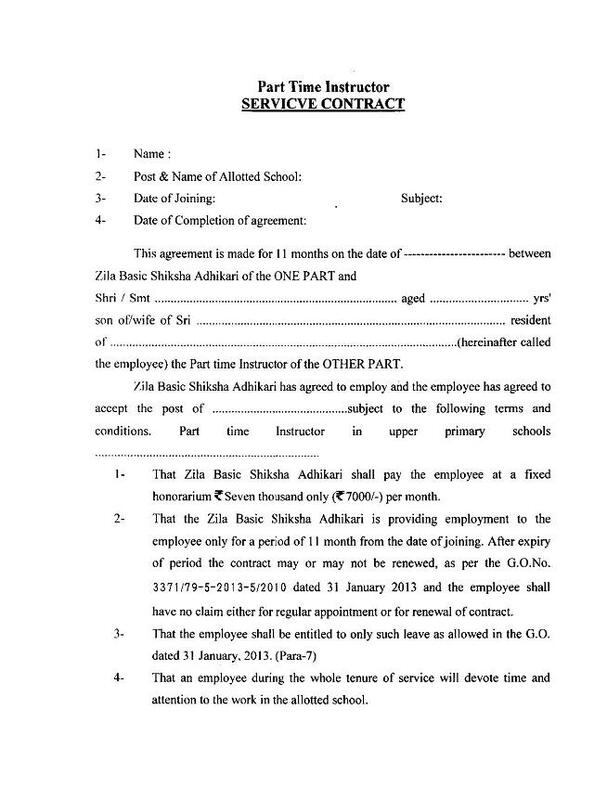 Similarly the employee can resign from the Zila Basic Shiksha Adhikari during the period of the contract by giving on month notice or an amount equal to one month salary to Zila Basic Shikaha Adhikari in lieu of the notice. IN WITNF.SS WHEREOF the partied have signed this deed on the date respectively shown against their signature.